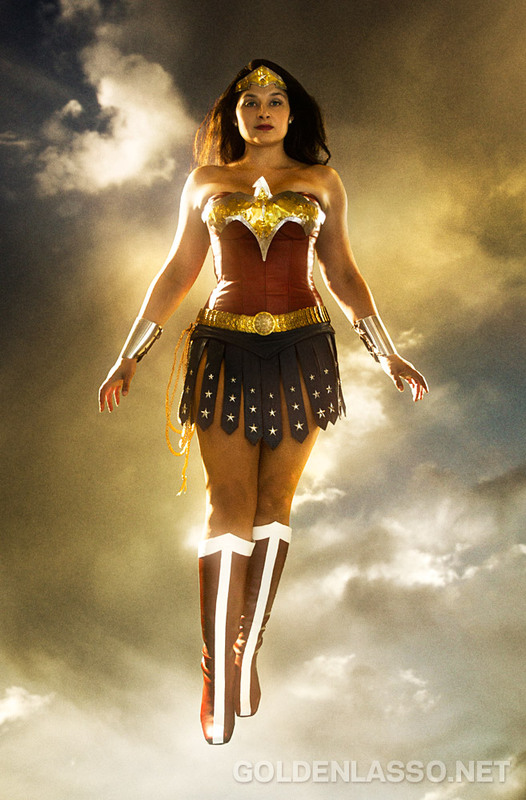 When I first designed my Wonder Woman cosplay, I wanted to make something that would be a believable real-world interpretation of Diana. 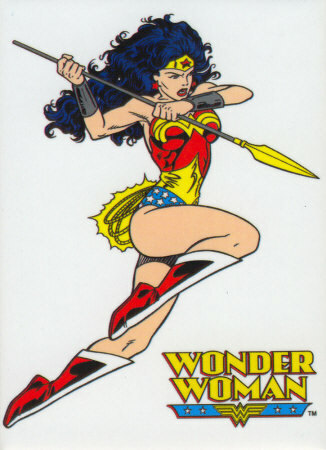 That did not include the white and red go-go boots that are part of Wonder Woman’s trademark costume, so I chose to go for the more Amazonian look of greek sandals and lace-up steel greaves. Since then, I have wanted the more traditional boots so I can be more easily recognized at cosplay events… because people seem to think I’m a patriotic Xena. Go fig. 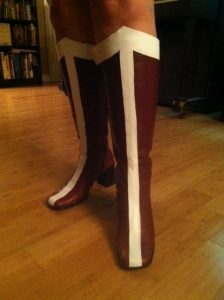 There are a lot of affordable Wonder Woman boots for sale, however, my unique costume made things difficult because the shiny, bright red boots available online wouldn’t match my muted, matte leather look. This limited me to two options, have them custom made or make them myself. My teacher salary and common sense made me choose the latter. Step one, find boots. This step was very difficult for me, but I had an incredibly specific set of requirements and I was not willing to compromise… or pay over $50. I did weekly searches of Ebay, Etsy, and my local used clothing stores to find the perfect pair. Ebay eventually resulted in the perfect pair of tall leather burgundy boots in my size, for a price that I was willing to pay. With shipping, they put me back about $30. I had leftover white leather from my Sif cosplay, so it worked out perfectly. The next step is to make the pattern. I highly suggest that you get a friend to help you with this because you have to be wearing the boots to get an accurate measurement. 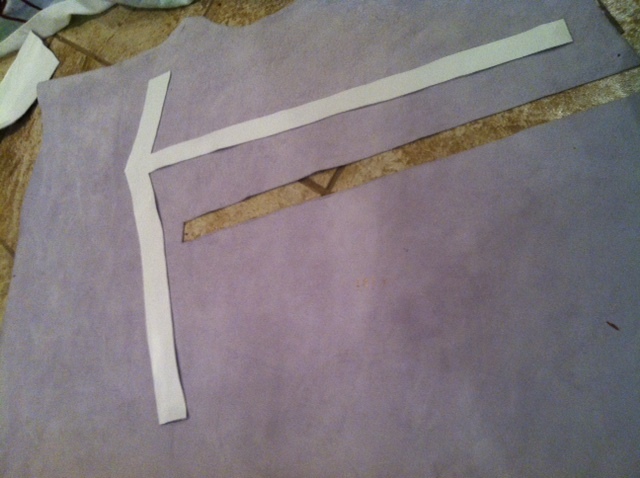 I used white interfacing that I cut in strips and taped in place with scotch tape to create my pattern. 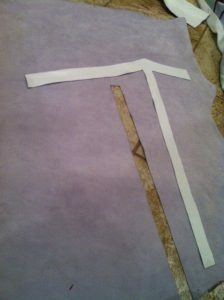 The interfacing has similar properties to the leather, and was already laying around my workshop. I started with the stripe at the top of the boot, being careful to cut it in a triangle based shape that would peak in the front and then meet behind my calf. I then measured a long strip to run down the front of the boot. 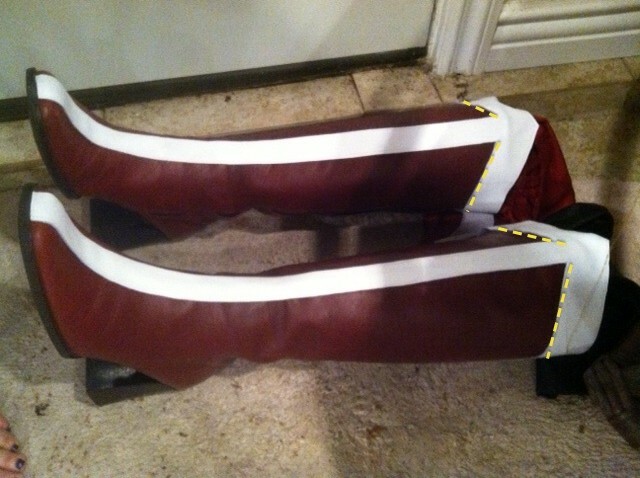 When I got the mock-up fitting exactly right, I carefully pulled these pieces off the boot (careful to keep them together as one piece) and traced them onto the back of the white leather. I used a pencil to insure that it wouldn’t show later and CAREFULLY cut them out. Make sure that you cut one for the right and one for the left, they should be mirror images of each other. If you get two identical pieces, you did it wrong. After I cut them out I stitched white thread along the edges of the white to give it texture. It will also make it look like the stripes are sewn on, when they will (mostly) just be glued on. PRO TIP: Cut slowly and don’t use the full length of the scissor blades. This will insure you get smooth lines without those annoying jagged spots. 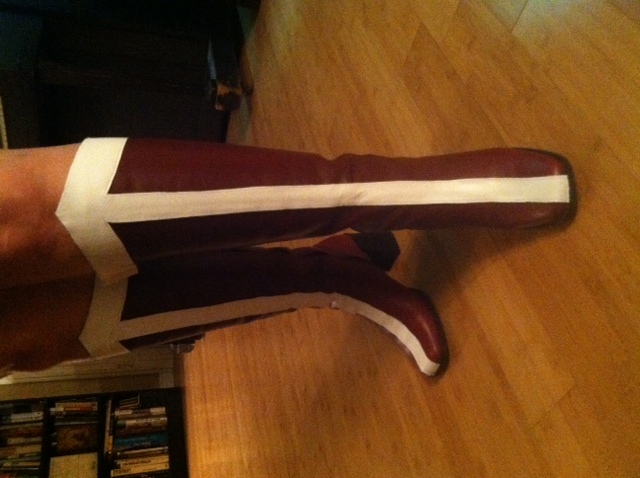 Once the pieces are cut, you should TAPE the stripes in place on the boot using masking or painters tape. Pins will leave little puncture marks in the leather, so avoid them. You should be wearing the boots for this step because the intended center of the boot and where the center of the boot is on your calf may be two different things. Trust me, I learned that the hard way. Double and triple check that you like the way the boots look and that they match each other. Pay special attention to the high point at the top of the boot and if the front stripe lands in the same place on both boots. 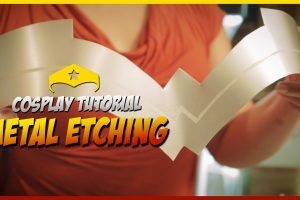 Once they match you are ready to start attaching them! 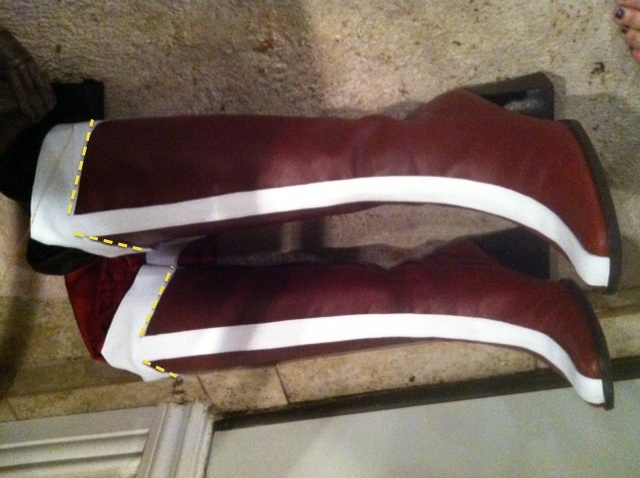 I wanted to make sure my boots were super strong, so I sewed the top stripe to the top of the boot. (The yellow dotted lines in the picture to the left show exactly where I did the sewing.) 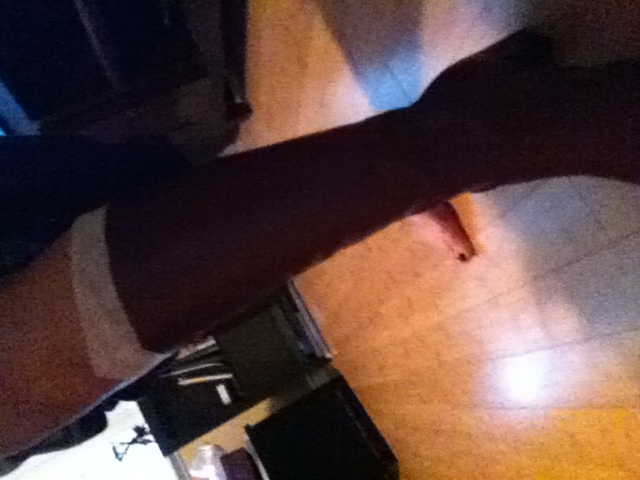 You can usually use a normal sewing machine for this unless the boots aren’t made of dress leather. Once this part is sewn together you should stuff your boots (with newspaper, extra cloth, etc) until they hold their shape themselves. You will then use Barge cement to glue down the stripe in the front and to finish attaching the stripe at the very top of the boot. Follow the application directions on the can to get the best hold. This glue needs 24 hours minimum of undisturbed drying time to get it’s full hold, so don’t wear the boots for this step. Wait at least 24 hours before messing with the boots. Seriously. This is the hardest part for me, but learn from my mistakes and don’t move the boots around until they have dried for at least 24 hours. 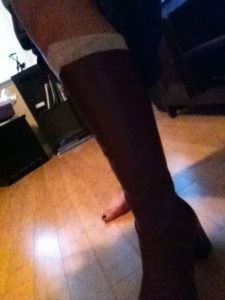 Once the boots are completely dry, you should remove the tape and try them on and see if everything turned out the way you wanted! If there are any small spots that aren’t glued down around the edges you can add tiny drops of Barge with a toothpick or small paintbrush. Congratulations! 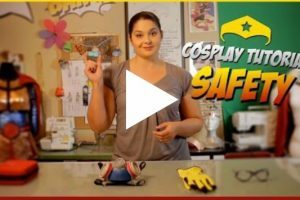 You can now make your own unique pair of custom Wonder Woman boots on a budget! Just like the pros do it! They look great!